The chef prefers using regular soy sauce instead of low-sodium (for better flavor). The dressing can be refrigerated a few days in advance. For the dressing: Whisk together the sugar, rice vinegar, soy sauce, toasted sesame oil, chili oil, peanut butter, ginger and water in a medium bowl, to form a shiny, emulsified blend. For the salad: Bring a pot of unsalted water to a boil over medium-high heat. Add the soba noodles (to taste) and stir; cook according to the package directions, then drain, rinse until cool and drain again. Divide the lettuce (to taste) among individual plates. Top each portion with an equal amount of the cooled noodles, then scatter each one with some of the edamame, scallions and grape tomatoes. 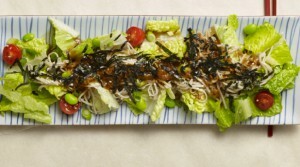 This entry was posted in asian, recipes, salad, salad dressing and tagged edamame, nori, romaine, scallions, soba noodles, tomatoes by admin. Bookmark the permalink.